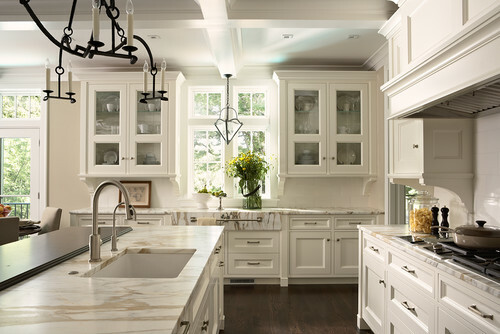 Calacatta Gold marble from Prestige Marble and Granite tops the island in this beautiful kitchen. 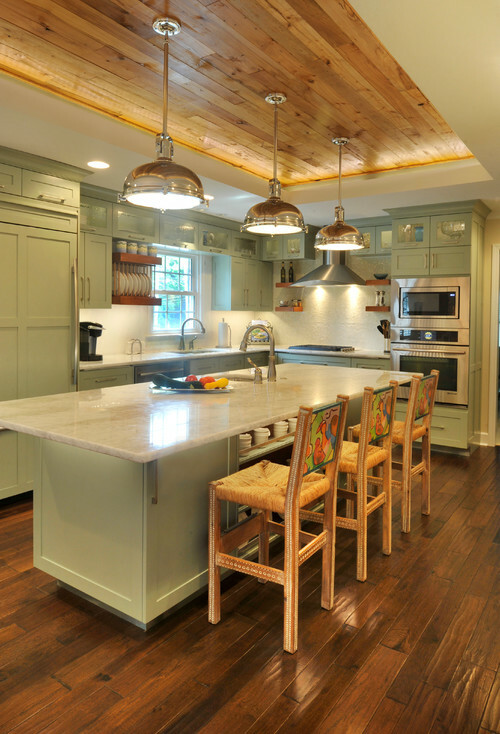 Kitchens renovations are not inexpensive; they’re a long-term investment for most homeowners. While kitchen design trends tend to be slower to change than general interior design, there are always some refreshing new looks that are worth considering. Here’s a look at what’s trending in kitchen design. Combining modern and traditional elements in kitchen design is a big look. Many homeowners are shunning ultra-sleek, contemporary kitchens in favor of spaces that are cozy and warm, and reflective of their personal styles. This inviting transitional kitchen by Columbia Interior Designers & Decorators Tbektu Design + Development, LLC incorporates modern and traditional elements for a look that’s both modern and homey. With more and more baby boomers wanting to age in place, the principles of universal design (designing space with aging users in mind) have really taken off. Drawer appliances such as microwaves, dishwashers and refrigerators are smart design in addition to allowing easy access for those with limited mobility. Faucets with motion sensors and handles on doors (instead of knobs) are also important universal design elements that are trending. Kitchens are embracing natural, raw materials in place of drywall and we’re seeing walls showing up in brick veneer, concrete and reclaimed wood, along with tongue and groove, wood plank and exposed beam ceilings. 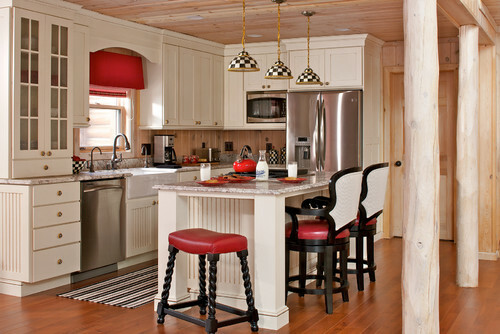 This farmhouse kitchen by Harbor Springs Home Builders Cottage Company incorporates a very natural look with tongue-in-groove ceiling and walls, wood floors and granite countertops. With the trend for natural materials strong, wood flooring continues to migrate to the kitchen, and plank preferences are getting wider. Dark wood flooring has remained strong, but medium to light wood flooring, often in off-whites to warm grays, are gaining in popularity for kitchens. 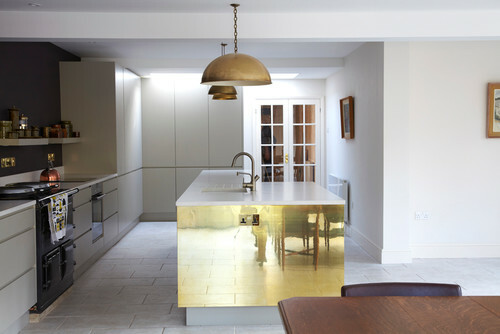 While chrome, nickel and stainless steel have been the reigning kitchen metals for some time, warm metals like brass, aged gold, copper and bronze have become the hot metals to have. These modern, warm finishes are showing up everywhere in kitchens: taps, sinks, range hoods, hardware, light fixtures, even bar stools. Mixing metals is also becoming increasingly popular. As open kitchen design continues to rule, furniture style cabinetry and other elements have become a popular way to integrate the kitchen to your home’s overall style. The designs available celebrate the different elements of the kitchen as pieces of beautiful furniture, not just workstations. 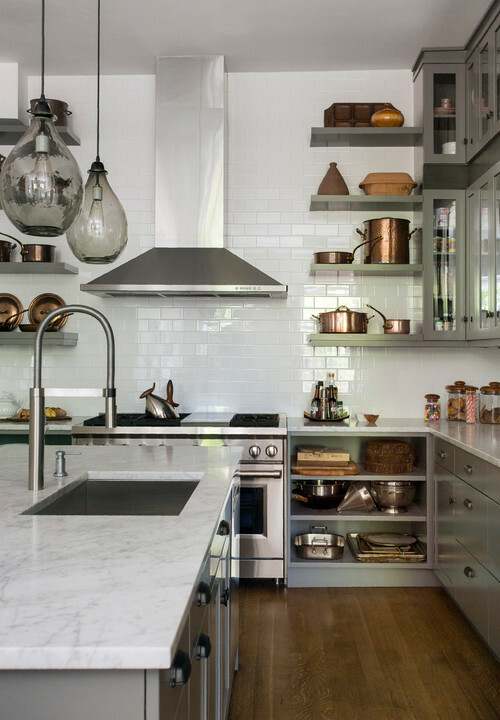 Though kitchen cabinets have their place, open shelving is a rapidly growing trend. 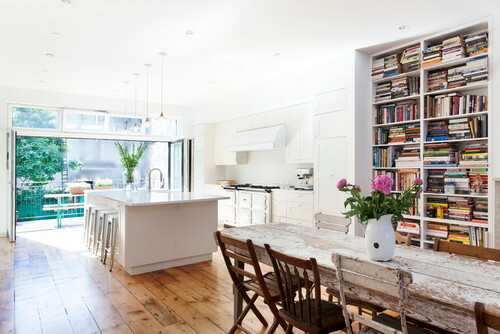 It’s fashionable to display almost everything – people want to show off their fancy cookery and crockery, and open shelving is the best way to do just that. It’s a great look and makes finding your things much easier, to boot. 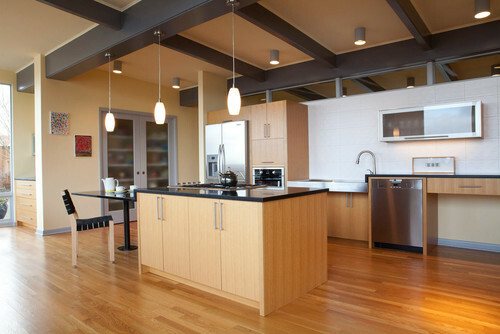 Open shelves are an efficient way to store frequently used items and they look fabulous in this contemporary kitchen. If you are tired of white, cream or stained cabinetry, this is your time to shine. Designers are dressing up kitchens with custom cabinetry painted in rich jewel tones like sapphire, emerald and ruby, accented with gleaming brass and chrome. For extra drama and light-reflecting sparkle, use a high gloss paint. 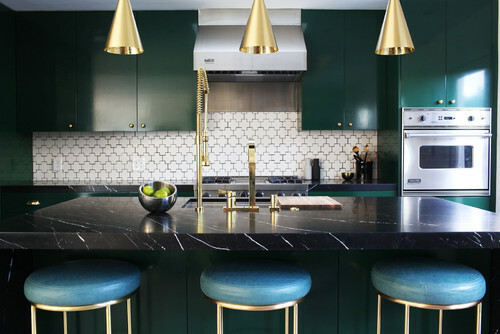 The emerald cabinets pair beautifully with glamorous brass accents in this mid-century kitchen by Los Angeles Interior Designers & Decorators Caitlin & Caitlin Design Co. Credits: Click on images to view sources. For classic, timeless design that reflects your personal style, Prestige Marble and Granite offers a wide array of premium stone countertops, including rare and exotic varieties for making a one-of-a-kind statement. Custom fabricated from nature’s finest materials, a natural stone countertop from Prestige Marble and Granite will give your guests something to talk about! Carrara or Calacatta? They’re both Italian, they’re both white with grey veining, and to confuse matters even more, much of Calacatta comes from Carrara. 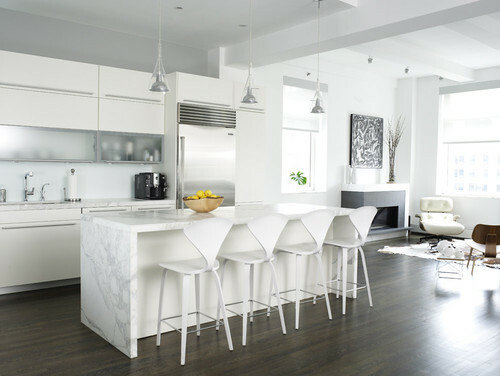 There are differences, however, and once you know what to look for, you should be able to distinguish between Carrara and Calacatta like a pro. Large, dramatic veining is a trademark of Calacatta and one of the most noticeable differences. The patterns tend to be bigger, bolder and more contrasting than Carrara marble. Another defining trait of Calacatta is the whiteness of the background. The whiter the material and the more “uniform” the veining, the more rare, and thus more expensive, the slabs. The look of Calacatta is luxurious and it should be because Calacatta is even rarer than Carrara. This Calacatta slab with it’s dramatic grey veining makes a stunning fireplace surround. This kitchen is clad in a variation of Calacatta that has warm gold veins mixed in. Calacatta Gold works well with both cool and warm tones. You’ll notice the veining of Carrara is smaller and finer and the color is grayer over all. While Calacatta can vary in tones, Carrara is classically gray. Although Cararra can have have some large and dramatic veining like Calacatta, it will also has many fine feathery lines. 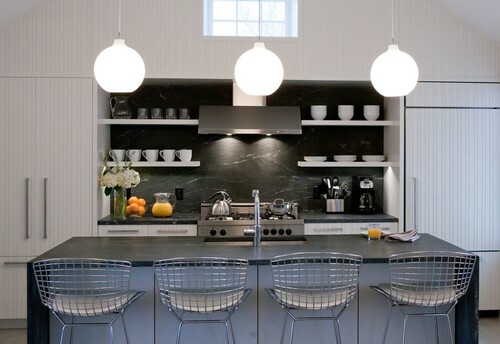 Carrara marble is the perfect choice for this unfussy, yet sophisticated kitchen. 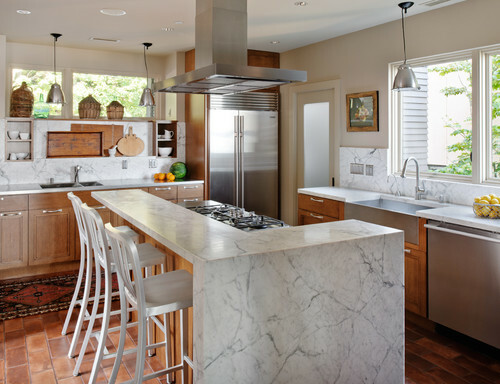 Although the Carrara in this kitchen has some bold veining, unlike Calacatta, it is grayer and also has many fine lines. While Calacatta feels more opulent than Carrara, that isn’t good or bad –it just depends on what type of room you’re designing. The subtler look of Cararra marble can still be used to create a very sophisticated look. Carrara is a classic, while Calacatta is a showstopper. They both look fabulous in kitchens and bathrooms, or anywhere you would like to add a touch of sophistication or elegance! Photo Credits: Click on images to view sources. Here at Prestige Marble and Granite, we only select the best Calacatta and Carrara slabs, the rarest, the most unique – the one in a thousand. The slabs with the most gorgeous veining and most pleasing patterns are the ones you’ll find in our designer showroom. You can count on us to have the finest stones available for a look that’s unique and characteristic of your personal style.